A couple of years ago, I interviewed Fatma El-Mehdi, an activist for the Western Sahara independence movement in its long struggle to secede from Morocco. She’d flown into New York from the Sahrawi refugee camps in Tindouf, Algeria, and after our long, warm conversation, which lasted almost three hours, she presented me with a colorful bilingual cookbook entitled Dining in Refugee Camps: The Art of Sahrawi Cooking. I was surprised and intrigued; it was the first time I made the connection between food and conflict. It is well understood that food is inextricably tied to identity, and cookbooks can transcend recipes to become forums for assembling narratives and archiving heritages, no matter how tiny the actual places, or marginalized the cultures, from which they arise. The motivations for writing a cookbook are only exacerbated when framed by issues of dispossession and displacement, and the overarching violence of war that may drive it all. There is something obvious, then, about the imperative to write a book about Palestinian cuisine, but the extraordinary delicacy with which Laila El-Haddad and Maggie Schmitt have composed Gaza Kitchen is less so. Cuisine from Gaza forms only one component in a book that maintains an exquisite choreography between ethnographic document, feminist storytelling, land and agricultural politics, developmental economics and Gaza’s troubled history. Laila El-Haddad is a writer, activist and spirited creator of the award-winning blog Gaza Mom, which went on to become the book, Gaza Mom: Palestine, Politics, Parenting, and Everything in Between. Maggie Schmitt, a writer, translator and educator, now based in Spain, has developed what she calls “a hermeneutics of the kitchen,” which forms the intellectual backbone of Gaza Kitchen. Though still in the throes of their whirlwind tour promoting the book, which has been widely reviewed and warmly received worldwide, El-Haddad and Schmitt agreed to a three-way Gmail chat with me. In the conversation that follows, they hold forth on the dynamic women of Gaza, the resilience behind new agricultural initiatives, their disregard for “hummus kumbaya” and how they evolved their special brand of kitchen anthropology. Bhakti Shringarpure: Laila and Maggie, it seems that, speaking in a more traditional sense, cooking and cuisine doesn’t really appear in your career trajectories. How did you arrive at writing a cookbook? Maggie Schmitt: I've always loved food and cooking, and as a constant traveler have long known that snooping around kitchens is one of the best ways to get into intimate spaces, have contact with women’s worlds and understand more about what’s really going on. But it was never a professional pursuit, just an interest. Laila El-Haddad: For me, there was an added dimension to the snooping and fascination with food, and in particular, Palestinian food. I grew up as a child of diaspora, to Palestinian parents from Gaza City and Khan Younis, [living] in the Gulf. We'd commute to Gaza regularly, but I always felt somewhat absent, disconnected, dispossessed of my identity and place in the world, on the maps, in books...never really fitting in. So my culinary interest evolved from this starting point: food as a bridge, as a link, as a way to locate oneself. The fact that the foods my parents recollected form their childhoods (and often would not make for fear we'd find them unappealing) seemed so different from any other Palestinian foods I was familiar with (via other non-Gazan families in the Saudi Arabian compound where we lived). That piqued my interest even more. Why was the food of Gaza so distinct, so varied, even in an area as small as Gaza (between my mother's town, for example, and my father's hometown)? I took pleasure in uncovering what I viewed as treasured secrets and sharing them with others as a way to start a conversation about Gaza and about Palestine in general. 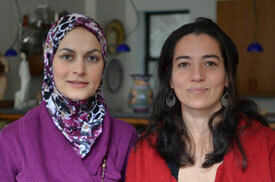 My interest in food in evolved from there, and not just in Palestinian food. Wherever I traveled, I often found the best way to understand a culture and a people and their history was through their foods and their kitchens. But it was always dream of mine to be able to codify the recipes of the Gaza region, and narrate the history through these foodways. MS: A friend knew someone at the Atlantic's [then] new food page and suggested I become sort of a foreign correspondent for them. I started jotting off posts from wherever I was working. I quickly got totally hooked on food as a point of entry, a way of talking about all kinds of other things – history, politics, economy, social change, aesthetics. It was sort of a revelation. So the article I did from Gaza was one of a series of food-related dispatches from different places. Writing from a food perspective got me thinking about different methodologies, too – ways of telling. I started doing what I called "kitchen anthropology." Lots of test runs around Spain. This is the method we then took to Gaza to do the field work. LEH: Palestinian women’s voices, especially in Gaza, are so often glossed over completely, or else represented in a very caricatured, mediated way by the press. What you end up getting are very reductionist portrayals: either shrouded, oppressed, obedient women, or as western feminists’ challenges to supposedly brutal Islamist rule. Otherwise, it is the images of wailing women that dominate the television screens. Seldom at all are we hearing and seeing the dignity and grace and constant steadfastness in which Palestinian women carry on with their lives, and their families’ lives along the way. MS: Its funny, all this time we've been touring, scarcely anyone has asked us about this. Just in the last day of touring, one audience member asked if we thought of the project as a feminist one. The answer for me is a clear “yes.” Perhaps the most obvious or visible reason is the focus throughout the book on women's lives and women's knowledge: foodways as a hugely female heritage, a whole body of orally transmitted knowledge and taste. It was important for us to focus on women's lives because they are so seldom and so poorly represented in any media portrayal of Gaza. The types of resistance available to women are particularly interesting: They themselves understand their daily tasks – the upkeep of their homes and the care of their families – as a form of steadfast resistance. LEH: Entering the private space of the kitchen gave us access we think otherwise would be difficult to come by; you are more relaxed, conversation starts flowing, suddenly you see women for who they really are and the incredible things they actually do. MS: But more than simply the focus on women's lives, the project is feminist in its methodology and in its political approach. Our focus on the everyday, on mundane spaces and microeconomics, on individual life-stories and households as a way of reading upwards towards larger political spheres, is shaped by a whole genealogy of feminist research. LEH: Being able to carry on with their lives, to often be the breadwinners in their families, to keep their families together through thick and thin against impossible odds, over decades, and to retain their dignity despite it all – this is really the ultimate form of nonviolent resistance, one that goes unseen, that is occurring on a massive scale. You also begin to uncover the reality that the power dynamics shift in those private spaces. Suddenly, it’s the women giving orders to the men: It’s their domain. It is also a realm over which they still exercise ultimate control, whereas they might control very little about their lives otherwise (as Palestinians, not just as women). BS: I found your conversation with Yotam Ottolenghi, author of the cookbook Jerusalem, really interesting. He claimed that Gazan cuisine, like Jewish cuisine, is a cuisine without terroir, or a unique sense of place. But we can also say that Jews settled in places and developed specific cultures in those places over hundreds of years. The Palestinian case is rather different. What interested me is that you spoke of Gaza as having a lost terroir. Can you explain? LEH: For the Palestinians, the terroir is very much present, even if physically many of the places form which they came no longer exist…if that makes sense. I certainly don't think their sense of place is lost, though the actual places may be. MS: One of the notable things that arose in our research was the local specificity of the different recipes we found, how consciously families retained the cuisine of their very particular villages several generations into exile. Those who were old enough to actually remember their pre-1948 villages spoke in incredible detail of the plants and animals they cultivated, the wild herbs, the spring water, etc. These memories are graven and unchanging, impressed upon them forever by the trauma of exile. Everything since then is the absence of those tastes and smells. Since then, their staple foods have been provided by food rations, etc., and their largely agrarian lives suddenly pressed into crowded refugee camps. They have adapted recipes to accommodate new ingredients or compensate for absent ones, but there is this sense of constant, permanent nostalgia. Because it is so specifically political a trauma and a nostalgia, it is actively held onto, not overcome or forgotten in a generation like that of so many other peasants forced into the city in so many other places. The nostalgia is handed down, like the keys to the family's house, from one generation to the next, as a conscientious political act. So, as Laila says, in the case of the refugees, there is no access to the terroir but the sense of it, the nostalgia for it, the longing for it, is very present. LEH: Yes, exactly: access. And we are talking, by the way, about places no more than, in some cases, a few miles away! But totally inaccessible to them. MS: But I would say that was/is the case in most of the Jewish diaspora, too: That’s where I would love to get into a discussion about this with Yotam and Claudia Roden in greater depth. The whole "wandering" paradigm has always been mostly false, and as far as I can tell, both the actual local terroirs – established, as you say, over centuries – and the nostalgias/longings (for Jerusalem, for Babylon, for Sepharad, for wherever you last were) are also many and layered...but that is a whole other story. BS: In your vignette titled “Slow Food on the Gaza Strip,” you write about Gazans turning toward self-reliance through small-scale agriculture and old methods of cooking and conservation – growing stuff on small plots of land, dovecotes and rabbit hutches on the roof, reverting to traditional pickling and jam-making due to electricity cuts. Could you tell us more about this? What is the scale of this movement? Is there hope for a substantive shift? LEH: We certainly witnessed a great deal of handiness around the home – marveled at the ways in which women would make ends meet and could put mouth-watering foods on the table with whatever they had access to. What we witnessed was remarkable: Women, effortlessly, seemingly without thought, constantly, continuously adapting, managing their households with incredible efficiency, overcoming obstacle after obstacle, policy after policy that very much intend to debilitate them, their livelihoods, their productivity, their freedom. When long-term electricity cuts became a reality, in conjunction with restrictions on the import of cooking gas, women returned to using traditional clay ovens to bake bread in (many still do, but not on the scale they once did in 2009, since cooking gas has been smuggled in through the tunnels). One woman we met, Adoolah, buries her lemons in her garden to keep them from spoiling, since the mineral clay is much cooler than the searing heat of the kitchen. Basically, for every obstacle there is an innovation or adaptation. Restrictions on fishing zones prompted two entrepreneurial brothers to start Gaza's first inland fish farm, and on and on. I couldn't talk about scale. To some extent, Palestinians have been doing this for generations. I think, generally, the current situation aside, Palestinians are very good at/have a history of "home economics," if you will. There is even a Palestinian saying: Mat ool fa'eer, ool ilit tadbeer (Don't say you're poor, say you can't manage what you have). I imagine this had to be put to the test not just in recent years in Gaza, but over the course of the past few decades, at various historical intervals, dating back to 1948 (and perhaps before, during the drought of the 1930s). But certainly this is happening in pretty much every household (maybe with the exception of Gaza's upper crust). BS: You also write about the Hamas-led government’s 10-year plan to reinvent Gazan agriculture on the land that Israel returned to Palestinians in 2005. How is this progressing? MS: In their 2010 "ten year plan" for agriculture in the Strip, the government has proposed a massive shift to local sustainability. Basically, faced with an indefinite siege, they propose moving away from agriculture for export (which relies on irrigation, imported fertilizers and pesticides, etc.) and towards rainfed organic agriculture on a massive scale in an effort to make Gaza as independent as possible of capricious border policies. To this end, they've initiated composting facilities, planted vast tracts of olives and dates, recuperated abandoned land, started fish farms, etc. All this is fascinating, and its sort of amusing to note this unwitting kinship between, say, Brooklyn hipsters and Hamas. The Gaza Strip, however, is a miniscule piece of land with a gigantic population and very little water. While this kind of effort makes a big difference in stretching the economy of individual households, there is basically no way Gaza as a whole could ever be self-sufficient in terms of actual caloric intake; until something like normal trade resumes it will always rely on food aid for cereals and other staples. One person we interviewed compared the government's efforts to the Iron Curtain policy, and pointed out that that didn't work even with all of the Eurasian steppe at the disposal of the USSR: How was it to work in tiny Gaza? [It is a] curious parallel, possibly one more motivated by political bile than economic understanding, but an insight into what in the book we call the "debate about sustainability" and how what happens in little Gaza often proves to be sort of a petri-dish version of more global debates, the world writ small. BS: In your book, the numbers you quote from UNRWA [United Nations Relief and Works Agency for Palestinian Refugees in the Near East] are depressing. Problems like malnutrition and anemia are rampant. Most families are eating every two days. Doesn’t reliance on food aid significantly alter the authenticity of the cuisine? And furthermore, does writing a cookbook become a more pressing task, or does it become anachronistic to the situation? MS: Good question. This is one we expected to get all the time, and somehow as we were touring it scarcely ever came up. First of all, Gaza, like anywhere, has a great diversity of economic situations. The wealthy are still eating very well, thank you, while the poorest are indeed struggling to get enough to eat. A majority of the population couldn't get by if people didn't have access to food rations for the bulk of their calories, but as long as these rations are getting to them, they do manage to buy the supplementary ingredients (fruit, vegetables, meat) that allow them to convert these rations into “cuisine.” So the recipes are still very much alive, and maintaining them is a point of pride to which families give a lot of importance. As Laila said earlier, when you control so little about the conditions of your life, the kitchen becomes this important haven: a place of order, continuity and creativity. LEH: Yes, precisely. There’s a whole “Isn't writing a cookbook a frivolous activity given the situation?” The situation makes writing such a cookbook all the more important. There is a sort of urgency. MS: For us, collecting these recipes and documenting them is, on the one hand, a testimony to families’ efforts to maintain their traditions and tastes. On the other hand, it was important to us not to present the recipes in isolation from a discussion of their current circumstances: This is not simply some idealized and eternal folklore, this is a real material practice which is evolving all the time, responding to circumstances. And the circumstances are pretty dire for a lot of the population. So we worked hard to strike a balance between ideal versions of recipes (if all ingredients were fully available) and real versions (given current shortages and substitutions). BS: I think it’s not about frivolity, but that something about cookbooks feels indulgent. That is the stereotype, I suppose. You book has completely subverted and altered the cookbook genre, so I would say it has largely transcended this debate. MS: Its good to indulge. Pleasure should be for everyone, not only the geopolitically and economically privileged. The lesson of the fig tree: Grows anywhere, and still has the sweetest fruit. LEH: Also because more than anything, I kept hearing again and again how sick people were in Gaza of being viewed as victims to be pitied (or else as aggressors); as though dumping tons of food aid on them would resolve the problem, when really, what they desired more than anything was to be seen and spoken of and spoken to (and speaking!) as human beings. LEH: You are the second person who has referred to our book as subversive! LEH: This whole notion that we enter through the backdoor was one we were very cognizant of from the get-go. In this sense, our book serves to give voices to the faces, to give the backstories, the context, while also celebrating the will to survive. BS: It is impossible to enter the realm of Middle Eastern cuisine without the issue of Israel’s appropriation of Palestinian and/or other neighboring countries’ foods. Examples include the anger over Israel’s nationalization of falafel or the controversial comments by chef Yotem Ottolenghi and his supposedly innovative version of baba ghannouj. Where do you stand in this quarrel? MS: One thing is sharing and enjoying the natural evolution of cuisine as elements that are adopted and recombined. Another altogether is directly appropriating with the political intention of annulling the other. For us, again, the key thing is to locate cuisine in context. The feeling that "Palestinian food has been stolen" sounds petty and silly if you take it outside the context in which Palestinian land, livelihood, rights, mobility, health, identity and so much else has been stolen. But with so much at stake, food becomes a symbol for identity as a whole, and the question becomes a very important one. MS: Yes, there are Jews from Arab lands who have also been making some of these foods for centuries, and are now in Israel. Origins are complicated. But to call these foods "Israeli national cuisine" does feel like a slap in the face. Israel, as a state, has only been around for 65 years – that’s too short to even have a national cuisine (whatever that is, anyway; what does cuisine have to do with borders and states?). It’s just an amalgamation of cuisines that folks brought with them from wherever they were before, plus the Palestinian cuisine, which is indigenous to the area. BS: There is an explosion of food culture in the United States at the moment, which seems to take foods and cuisines further and further from their political contexts. I was wondering, then, if there is such a thing as a “conflict cuisine?” How would we talk about such a thing? MS: I don't know about conflict cuisine as cuisine, but I certainly think, in the course of preparing the book, that we've both been totally convinced that cuisine is a way of looking into conflict, understanding the very material and everyday aspects of it, and from there a way of understanding some of the economic issues that underlie these conflicts (which are then later sold as conflicts over religion or ideology or whatever other hooey they can sell). I mean, Gazan cuisine and Guatemalan cuisine are as different as you can get, but boy, do they both have conflicts. But I do think maybe there's a way of looking at cuisine, which we're trying to introduce here, as a sort of hermeneutics of the kitchen which, I am convinced, sheds light on conflict in a really important and different way. A way of looking at conflict from the material details of everyday life, with all that it entails about economics and circulation of goods, but also about identity, history, how meaning is constructed and stories are told, how big politics plays out in each household (gender relations, family structures, time use, generational dynamics, etc. ), how little individual households respond to and intervene in politics... there is so much to this!? And while, as you say, there is this explosion of food culture in the US that is largely context-free, a sort of frictionless universe where you can eat everything, from the whole world (reminds me of a Mughal emperor who notoriously smeared his body with perfume-tributes from all his vassal states...this l'empire c'est moi of every consuming American), still I see this moment as a window of opportunity: If folks want to eat the world, and its become this sort of measure of social distinction to know your Laotian noodles from your Cambodian ones, then, hell, at least people have some idea where Laos and Cambodia are, no? It is an opening to tell some of the kind of stories we're trying to tell: Sneak in through the back door, as Laila says. At the same time, as there's the "eat the world" thing going on in the US, there's also a huge politicization of food. Some of it quite precious and silly, I think, and some of it really powerful, and if people are paying attention to issues of agriculture, land use, sustainability, access, cultural survival, etc., then the basis, or the idiom, for telling some of these stories is already established. It means there's an echo or recognition of these issues, which a few years ago there really wouldn't have been. And then, stretching the thing a bit more, I’m always sort of tempted to draw a parallel between the US and Gaza in terms of our roles as consumers. A lot of this politicization of food in the US has to do with the basic (and I think quite valid) observation that in a corporate empire, we are citizen-consumers; that is, our political role or function as consumers weighs more, matters more, and has more leverage than our role as voters or, for that matter, as workers. One of the things that struck me a lot in Gaza is the sense that Gazans used to be a pool of cheap labor for Israel, exploited through a series of agricultural and industrial policies. Now, no one even wants to exploit their labor, but they've become highly functional as consumers. Ironic for an impoverished population to be considered a key market, but I think they are: Absorbing agricultural surplus, paying hiked up prices for imports they have basically no choice but to receive, etc. And moreover, there's all this international aid money being dumped into Gaza to keep it alive: Basically, all of this circulates around Gaza a bit, and then ultimately ends up in Israeli hands, at what appears to be a huge growth for their investment. Its happening all over the world: productive sectors flattened, populations left to consume ridiculously overpriced things they wouldn't need if they hadn't been hamstrung in the first place. All photographs courtesy ©Maggie Schmitt. Bhakti Shringarpure is an editor for Warscapes magazine.